On Nov. 20, Governor Charlie Baker signed legislation, An Act Advancing Contraceptive Coverage and Economic Security in our State (ACCESS), into law. This comes in response to the Trump administration’s proposed rollback of Obama-era policies requiring employer health plans to cover birth control. This makes Massachusetts the first state to counter this policy. The new law, which received bipartisan support across the House and Senate, will protect Massachusetts residents from any changes to the contraceptive policy of the federal Affordable Care Act. ACCESS requires health insurers to provide copay-free contraceptive options of no less than one type of FDA-approved birth control options, and was developed out of collaboration between health insurers and women’s health advocates. ACCESS not only protects existing contraceptive coverage, it also expands coverage. WBUR reported that insurers now have to provide a full year of birth control pills at a time, instead of the current three months at a time, as well as cover more types of birth control and emergency contraception (without a prescription). 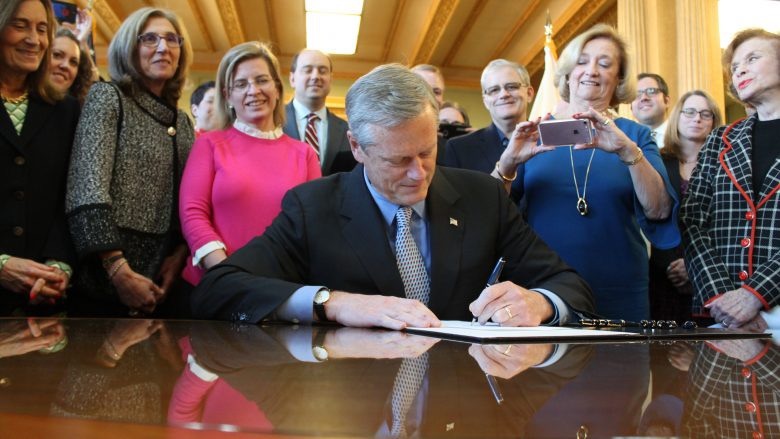 Governor Baker was joined at the signing event by constituents such as Attorney General Maura Healey, Senate President Stanley Rosenberg, as well as the Planned Parenthood League of Massachusetts President and CEO Dr. Jennifer Childs-Roshak, and other advocates. MassLive reported that Childs-Roshak, a family doctor, said she witnessed patients with high copays cutting pills in half or using less effective forms of birth control because they could not afford the high copays. “Everyone deserves the ability to stay healthy, plan their families and focus on their future–no matter who they are, where they live or who they work for,” she said. Andrew Dreyfus, president and CEO of Blue Cross Blue Shield of Massachusetts, was also present. “Blue Cross has a long history of working collaboratively to develop innovative, cost-effective solutions to challenges in health care delivery. We’re proud to support this legislation that once again establishes Massachusetts as a model for the rest of the country,” Dreyfus said.